Street Fighter V is one of the games available at E3 in 2015, and we had a chance to test it. Unique to PS4 and PC, the title seems to respect the traditions and at the same time, innovative. But this can be dangerous, especially when it is a classic, with characters like Ryu, Ken, Chun-Li and many others. Check the news that this may be your next fighting game. The "V" in the title is not there by chance. In addition to representing the number "5" in Roman numbers, it also refers to the V-System, the system that dominates the basic gameplay of the title. This was an addition to make it quite different from the previous one, and one that proved right, at least in the demo test. The V-System is present in many formats in Street Fighter V. What is striking is the V-Trigger, a bar with two levels, activated with two strong blows pressed at the same time, and able to unlock a type of hidden power of each character. It fills up as you hit or catch and can deliver special moves more easily or use another type of skill. With the V-Trigger activated, Ryu, for example, can carry his famous Hadouken and drop it harder and intensity, although this is not the Shinku Hadouken, your special move. Already Chun-Li, receives more successes with each of his normal moves and can use a flying fast to hit your opponent. 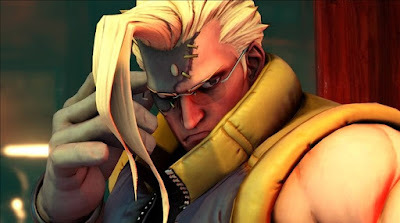 The only fighter for now, with a V-Trigger which works differently is Nash, the former partner of Guile, who is back from the dead as a kind of "zombie". By activating your V-Trigger, it uses instantly carried him from one side to the other of the screen, surprising the opponent. Already the Critical Arts bar, another game in this menu serves to activate special moves, the old "Ultras", who are not called more so here. However, they basically have the same visual effect and also in terms of damage. Speaking of looks, the goal of producing inserting these new bars is just make the game a little more "obvious" and draw attention of those who have not the custom of playing fighting games. In a way, the V-Trigger has always existed in the previous version in Ultra Street Fighter IV, but here it is more and easier to understand. Furthermore, the factor graph are well-differentiated. The game is really pretty and polished, with characters that have more volume and differ slightly from what was seen in Street IV. While there were more "cartoon" fighters, reminding cartoon, here they gain more human features and proportions, as well as a different texture. In our test, the controls were easy to assimilate and the blows were basically in the same place as always. The only exception that we noticed was the Chun-Li, who does not turn over your Lightning Kick with a command similar to Ryu's Hadouken, and not just pressing the shot button several times. Perhaps Street Fighter needs not exactly a revolution, as the previous ones were well accepted by the public and critics. But still, Street Fighter V and fulfills the role of being a worthy sequel, and a beautiful addition to PS4 collection, since the game is exclusive to the Sony machine in terms of consoles, although it is also scheduled to release on PC. The game aims to please the fans and, although it has announced only six characters, promises to reveal a strong cast over the coming months. Thus, the intention is to please old and new fans of the saga.